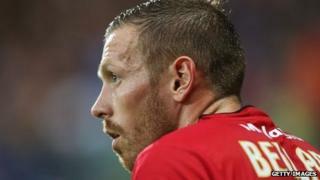 Footballer Craig Bellamy has been banned from driving for six months after admitting failing to declare he was the driver when his car was caught on a speed camera. The Wales and Cardiff City striker already had nine penalty points for three previous speeding offences. The six points awarded for this offence pushed him over the 12-point limit. He was also fined £900 and £400 costs. Bellamy, 33, was not at Liverpool Magistrates Court for sentencing. Simon Leong, prosecuting, said Bellamy was sent a notice after his Audi was caught travelling at 64mph (103kmph) in a 50mph (80kmph) zone along the M62 towards Liverpool on 3 April 2012 at 0300 BST. He was on the books of Liverpool FC at the time. Mr Leong said: "A notice of intended prosecution was sent to his address but the defendant did not respond." The former Manchester City and Newcastle United footballer was charged with failing to give a driver's identity after the police issued a notice of intended prosecution. Bellamy initially pleaded not guilty but changed his plea at a rescheduled hearing in December. Defending, John Rowan said Bellamy had denied the charge as the notice had been sent to an address where he was not living at the time. "A plea of guilty was substituted in relation to that and he did accept that perhaps he could have done more to intercept the notice and ensure that the details were completed," he said. He added this was his client's first disqualification. Deputy District Judge Simmons gave Bellamy credit of 10% for his guilty plea and fined him £900 plus £400 costs and £15 victim surcharge. However she added: "Given that he has nine penalty points already he must be disqualified from driving for a period of six months under the totting up provisions."